This is a horror game parodying edutainment games of the 1990s. In it, the objective is to collect seven notebooks and escape Baldi's madhouse school. After collecting a notebook, the player must correctly answer a series of elementary school-age questions. 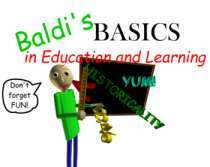 Every time a question is answered wrong, Baldi will get angrier and attempt to dismember the player. Some of Baldi's friends will also try to distract the player, putting him/her at further risk of getting caught by Baldi. There are other entities in the school that try to hinder your progress, such as a jump-roping girl, the school's principal, a giant talking broom, a bully, a sock-puppet, and a hug-loving Cyborg on wheels. Throughout the game, the player will find various items, which can work to his/her advantage when fending off Baldi and his friends. It was hurriedly slapped together in a couple of days for a contest, and it shows, yet despite this, the game has almost immediately gained a cult following for uniquely utilizing a "terrible yet nostalgic 90's edutainment games" motif, along with creating a fandom comprised mostly of people from the previous "big" indie horror games. In response, the developer greatly expanded upon it with a content update. In July 2018, a successful Kickstarter was funded to create a full retail version of Baldi's Basics, which would tentatively include new features such as new characters and items, randomly generated levels with new rooms featuring new mechanics, random in-game events to change up the gameplay, and a "field trip" bonus round to unlock buffs in the main game.